Okay now I have some basic circuits the next thing that I wanted to do was to build the circuit on some strip board and make sure that it would fit inside a small hand held box, the box that I used can be brought from maplin and seemed perfect for the job; it’s big enough to fit the electronics in, has slots so that I can easily mount the PCB that I’ve made and is deep enough so that I can mount the connectors with a wiring loom attached. The Solenoid Valve that I used can be brought from solenoidvalvesuk, and it was Shako PU220AR, I paid around £30 with VAT. The fittings for the valve can be brough off of eBay for a few pounds and the size of the inlet and outlet fitting will depend on the size of the water drops that you want. 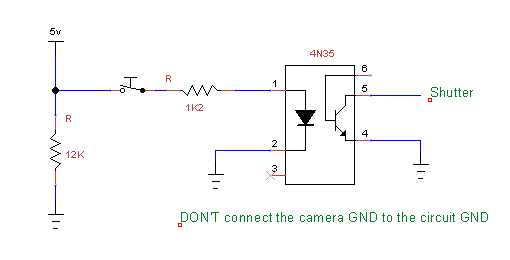 The first thing is to make a rough circuit for triggering the camera shutter and the flash, as I said earlier I had previously done this with a transistor and a relay but after reading a few posts about water drop photography it became very clear that a relay just isn’t fast enough due to its mechanical nature. Transistors on the other hand are very fast switching and so they are perfect for the job. 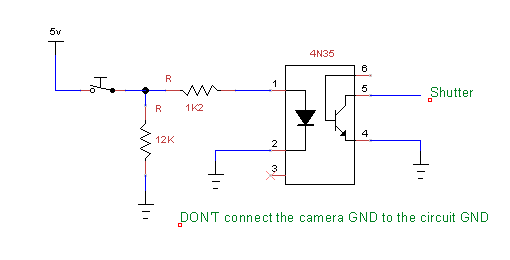 I wanted to keep the camera and flash trigger separate from the Arduino as the high voltages that the flash produces could damage the Arduino, and I plan to do this with an ‘opto-isolator’. 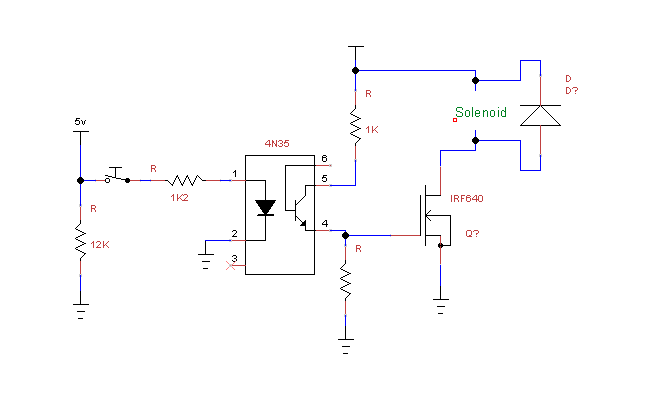 An opto-isolator is basicly a LED and a Photo Transistor in a DIL package, turning the LED on will cause the transistor conduct but there isn’t any electrical connection between the 2 devices which means that the transistor is isolated from the rest of the circuit. Here is a very simple diagram that should get you started, you’ll need 2 of these, one for firing the shutter and one for triggering the flash guns; obviously the switch is just there to simulate an Arduino output pin. The next circuit to work on was the sensor which would detect when something has passed through it; again this is a simple diagram. I have shown an opto-coupler in the circuit below, the advantage of an opto-coupler is that it is already assembled in a package is there is no need to align the LED and Photo Transistor; however the disadvantage of an opto-coupler is the very small working distance. Another method for a sensor could be to use a laser point and an LDR (light dependant resistor), this will allow a much greater working distance; but aligning the 2 devices can be tricky and the LDR will be effected by ambient light! For consitant water drops the best thing to use is a solenoid valve, however these require a minimum of 12v and also draw more current that an Arduino pin can supply. 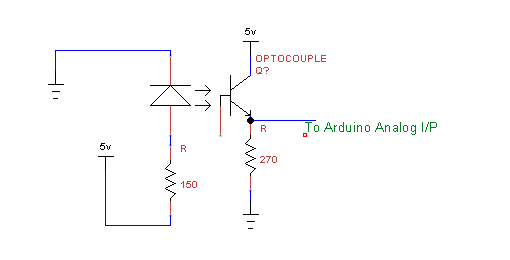 We can still use the Arduino for controlling the solenoid, and this can be done by using an output pin to drive an opto isolator (as in the circuit above) which will turn on a FET and activate the solenoid, the idea of using an opto isolator to drive the FET is to protect the Arduino board from any harmful back EMF from the solenoid. Below ciruit that I got from the tutorial section on the Arduino website, I have made 1 or 2 modifications as the one on thier website didn’t work in the way that I wanted it to! Being an engineer at a Postproduction House gives me an opportunity to learn new skills and get involved in some interesting projects. A few years ago one of these projects was to make a small camera controller that could be integrated with a motion control rig and a Nikon D3. The idea was to build a tiny PCB that would receive a pulse from the motion control rig and this would in turn fire shutter in the D3. This was simple circuit and was achieved with a transistor and a relay, but this did get me thinking that I should build something like this for home use. At the end of last year I heard about Arduino Duemilanove/Uno, this great tool can be programmed and integrated into electronic circuits to do all sorts of wonderful things and it was just the thing that I was looking for! I had recently tried to take some shots of water drops but out of (roughly) 300 shots there were only a few keepers, however with an Arduino and a simple circuit I’m hoping that the keep rate will be much higher; there are products that can be brought which will do this exact thing one of which is ‘stop shot’ but these are expensive and I find that half of the fun is in the designing, building and programming!! Water drop photography is very addictive and you’ll find yourself constantly thinking of new ideas and designs for crowns and collisions! The thought behind the process is that the flash duration will freeze the water. I’ll have my setup in a totally dark room and the camera will be in bulb mode; so the shutter can be open for as long as I want and then flash will freeze the motion and then the shutter will close. All of this will be controlled by the Arduino and all we need to do is press a button! !